Are you training for a marathon, half-marathon, or trail race this Spring? Be part of the Centre Volunteers in Medicine (CVIM) Marathoners for Medicine Challenge Team and use your love of running to make a difference to our neighbors without health insurance get affordable medical and dental care. Centre Volunteers in Medicine is a local community health resource center that provides medical care, dental care, case management, and medication assistance to our local neighboring residents without health insurance. They depend on donations, and any amount that you raise by being part of the team goes directly to CVIM. Whether or not you can join a team this year, please consider giving to this year's CVIM Marathoners For Medicine team. Here's a link to the donations page. Pick a runner, or give in the name of the whole team! Please also save the date for our Media Day: April 14 at 12 PM at the Horace Ashenfelter III Multi-Sport Facility. And join our Facebook group to keep in touch with the rest of the team. 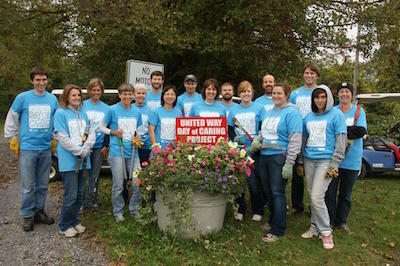 For the fifth year in a row, Cheree Jones and Sheryl Balkey helped to organize a crew of bushwhackers for the United Way Day of Caring,. The project was again the golf course perimeter bikepath/jogging path, this time along the south and west edges of the Penn State Blue Golf Course. There were saplings, bushes, brush, assorted shrubs, and unruly tree branches that were clogging and cluttering the path, as well as an ungainly tree blocking the view of runners, bikers, and drivers approaching the path's crossing of the Clubhouse Road. The volunteers were: SF & Company (12 volunteers), Joe Hughes--Penn State Golf Courses PGA General Manager/Head Golf Professional, who helped tremendously with the planning and execution, and Sheryl & Seth Balkey and Cheree Jones. The crew cleared the way so that runners have a clear treadway and golfers can see runners so they can yell "fore!". The NVRC chipped in to pay for some food and refreshment. Here are a few pictures. Many hands make light work of shrubs, brush, and trees! Penn State’s Club Cross Country team has invited us to participate in their second annual “Miles for Smiles” fundraiser, benefiting Penn State’s THON. You might recall seeing a video of last year’s finish on the Runner’s World web site. It certainly looked like a lot of fun for a great cause. The Miles for Smiles fundraiser involves a 46 hour continuous run on a treadmill, with multiple runners taking turns to complete the 46 hour time period. PSU Club Cross Country has offered the NVRC one hour to run and help with the fundraising. The event will be held in a downtown apartment building, starting Jan 29 at 6pm, and ending Jan 31 at 4pm. Note that this is the same time frame as THON (although a few weeks earlier). We have some flexibility as to when we “run” our hour. NVRC would like to have 3 runners participate, each running 20 minutes, to fill up our hour. We would also like the runners to solicit funds for their run, either by a flat donation, or via a pledged amount per mile. We suggest a NVRC goal of $500, with each runner soliciting pledges totaling $150-$200. All of the money raised goes to THON. For those not interested in running, but want to support NVRC runners during our time slot, the 46-hour event will feature a different theme and alternative activities each hour. Some of these hour-long events will include yoga, friendly competitions, movies, and many more while somebody is running. It would be great to have a nice group of members present to show our support. Join the Wahoos as we train for an 8K loosely using a popular Training Guide for Novice Runners. See Calendar below!